I’ve got fennel orange pork meatballs coming your way today, with all the toppings and flavors you could ever need. 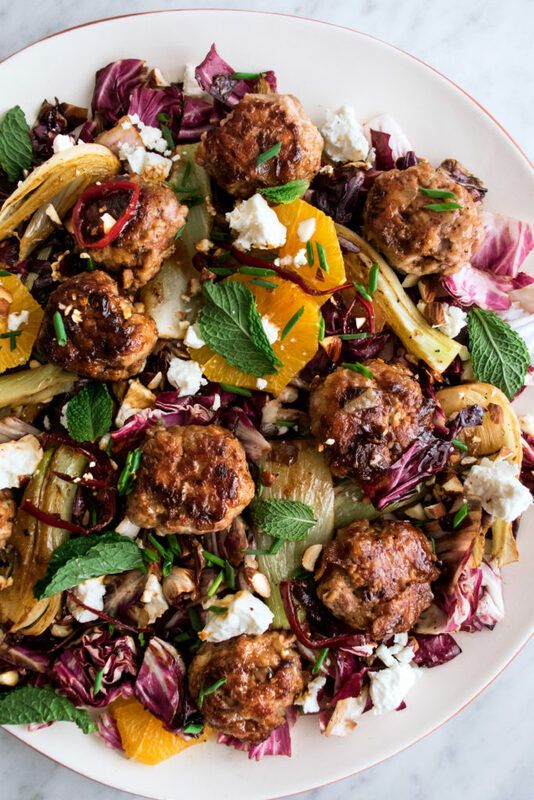 We’ve got a bed of sauteed fennel & radicchio, the roasted meatballs sitting right on top, a sweet chili glazed drizzled over everything, some fresh slices of juicy orange, tangy feta cheese, toasted almonds, and fresh herbs. It’s a mouthful… but an absolutely delicious one. I do a lot of my cooking on Sundays when we all gather at my parent’s house for our traditional weekly Sunday dinner. And when I say Sunday dinner…this usually includes a large brunch around noon, appetizers and tastings of whatever I’ve been cooking around 5pm, and then a full on feast by about 9pm. It’s a long day of eating, and honestly always just so much fun to get to cook for everyone. I think I’m always at my creative best when I’ve got family around to feed. I get so excited cooking up something a little unique or extra exciting for those I love. Long story short, the other Sunday my brother requested meatballs. 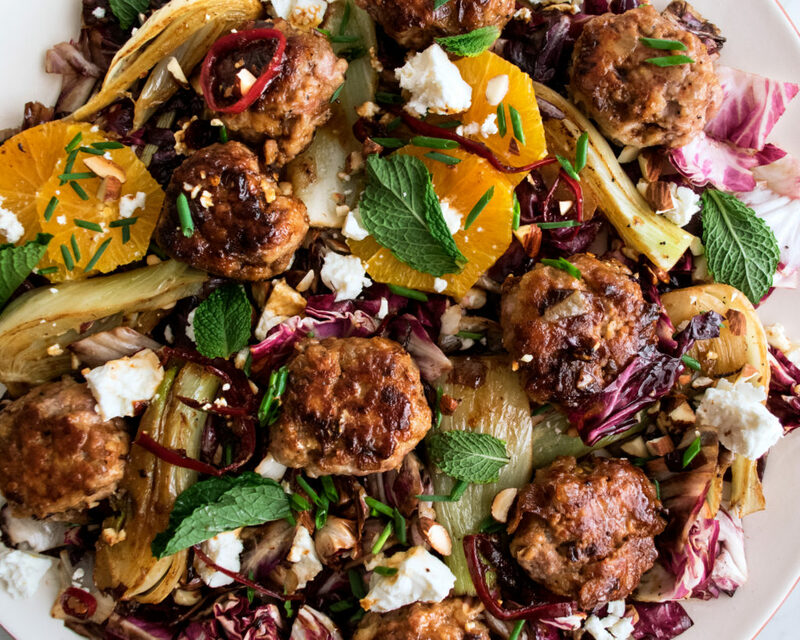 And so, these fennel orange pork meatballs were born. Preheat the oven to 375°F. Take the baguette and cut it into small cubes. Place the bread into a bowl and cover with 1 cup of hot water. Let soak for 8 minutes until the bread has softened and absorbed the water. Meanwhile, heat a small skillet over medium heat. Add enough olive oil to coat the bottom. Add the shallot. Let sauté for a few minutes until tender. Stir in the garlic, orange zest, fennel seed, ground coriander, and red pepper flakes. Lower the heat to medium-low and let cook for another couple of minutes until fragrant. Turn off the heat and let the mixture cool slightly. Add the ground pork, soaked bread, shallot mixture, and a generous pinch of salt to a mixing bowl. Mix well until fully combined. Form the mixture into approximately 16 (2 oz) meatballs. Heat a large cast-iron skillet over medium heat. Add enough olive oil to coat the bottom. Once the oil is hot, work in batches to sear the meatballs on all sides. Transfer the meatballs to a sheet pan. Once they’re all seared, place the meatballs into the oven and roast for about 6-7 minutes until cooked through. Reserve the skillet with the meatball drippings to cook the vegetables. Meanwhile, heat a small saucepan over medium heat. Add the slightest bit of oil, along with the red chilis. Cook for a couple of minutes until tender. Add the orange juice, apple cider vinegar, honey, and molasses. Bring the mixture to a simmer, lower the heat, and cook for about 10 minutes until the glaze is reduced and syrupy, stirring occasionally. While the meatballs are in the oven and the glaze is reducing, heat the skillet again over medium heat. Add the sliced fennel. Season with a pinch salt. Sauté until tender and caramelized, about 5-6 minutes. Stir in the radicchio and season with a pinch more salt. Let sauté for just another minute or so until the radicchio is slightly wilted, but still has its color. Transfer the fennel and radicchio to a large serving platter. Place the meatballs right on top. Spoon all of the chili glaze over the meatballs. Garnish with the fresh orange slices, crumbled feta cheese, toasted almonds, a sprinkling of fresh chives, and fresh mint.